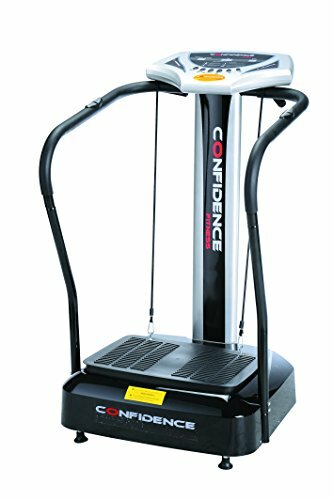 The latest design from Confidence Fitness is the new Vibration Plate. This compact machine is the answer to low impact, easy exercise with fast results in your own home. With a user friendly display console and simple to navigate menu, will make even the most inexperienced gym goers comfortable in training immediately. The Vibration Plate enhances even the most casual of activities and maximises the potential of your normal fitness regime. Whether your aim is to reduce weight improving your fitness and flexibility, or build up your muscles the power plate trainer plus will help you reach your goals. Sitting, standing or even lying on the vibration plate while doing simple weight-bearing exercises allows the vibration to stimulate and amplify the exercise. The vibration plate creates a high frequency vibration which causes a stretch reflex within the body. This means that the muscles contract involuntarily so creating the effects of exercise without the exertion of conventional exercises. The Vibration Plate is fitted with yoga straps to enhance its potential for improving the upper body and arms. Extending the straps in different positions works different muscle groups, pulling against the resistance of the straps further the muscle fibres for growth and toning. Just 10 minutes on the Vibration Plate is equivalent to 60 minutes of conventional exercise. You can begin to see results using for 10 minutes 2-3 times a week as part of a low fat and low calorie diet. Dimensions: 29" x 27.5" x 48". Vibration plate dimensions: 21" x 15". Weight 70 lbs. Maximum user weight: 300 lbs. Maximum Power 1.5hp. Input Power: 600W. Input Voltage: 100-120v. Frequency Range 50-60Hz. Speed Range 1-50. If you suffer from joint problems, have a heart condition or use a pacemaker, we recommend seeking medical advice before using a vibration trainer.